This is a small guide on how to do the jailbreak on iphone 3 g firmware 3.1 and firmware 3.1.2 tested only on the necessity of this guide is that many guides refer to the 3gs and 3 g there are some problems and we have to follow other steps. As a first step we make a nice backup of our iphone with iTunes so that you can restore in case of trouble, but don't worry. At this point we're ready to go, open blackra1n and press on the button single "Make it rain"
1. Open Task Manager (ctrl + alt + del) go to the processes tab and you need to terminate processes iTunes.exe and iTunesHelper.exe and IpodService.exe. 2. switch off the phone without removing it from the computer you will be shown a message about jb but aren't you ignore it by pressing OK and close blackra1n. 3. Now open blackra1n and press again the button "make it rain" switch on your telephone if you open iTunes to close it. Open and there will be a screen where you can choose to install Cydia, Icy or Rock your choice then your device will be definitively JAILBREAK. Try it and let us know if everything will work. Thank you Andy for his willingness to create driving and help really precious. Here's the guide that allows you to jailbreak firmware 3.1.2 / 3.1 on all Apple devices. We remind you that, owners of iPod Touch 3rd generation, who choose to jailbreakkare your device, they will have to redo this procedure at each reboot of your Terminal. • Owners of iPhone 3 g and 3GS alien must not perform this procedure to prevent installation of the new firmware, upgrading their baseband and the consequent inability to unlock it. • All users upgrading/restoring your iPhone/iPod Touch to firmware 3.1.2 must ABSOLUTELY perform a reboot before the start of the procedure. Launch blackra1n (preferably as administrators If Windows users) and we connect our iPhone or iPod Touch via USB. Press, and then, on the only button "make it ra1n", and we look forward to. blackra1n will restart your iPhone and put it in Recovery Mode. At this point we are waiting for a few minutes and, once you have finished this procedure, find our iPhone in the SpringBoard with a new icon placed in the first available space. 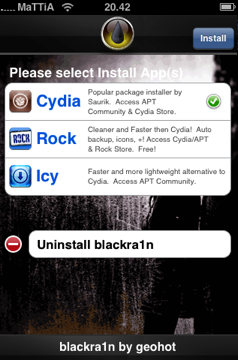 Open blackra1n (iPhone/iPod Touch), we select a tap on "Cydia" and then on "Install". 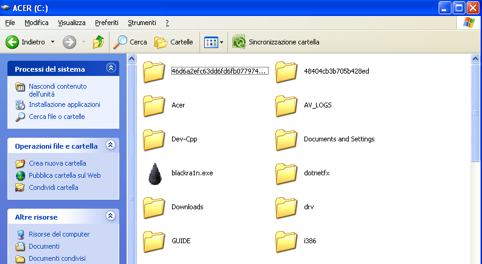 At the end of the procedure we can also delete the application blackra1n, necessary for the installation of various software. When we perform a reboot to get our iPhone or iPod Touch with firmware 3.1/3.1.2 jailbreak.